How to Tell If Something Is a Fruit or Vegetable? Fruits and vegetables are paired together so frequently, it might seem as if they are the same category of food. Webster’s Dictionary defines fruit as “a product of plant growth (as grain, vegetables, or cotton) and the usually edible reproductive body of a seed plant" and vegetables as “a usually herbaceous plant (as the cabbage, bean, or potato) grown for an edible part that is usually eaten as part of a meal.” Fruits are a part of the plant with reproductive responsibilities, while vegetables are the entire plant or edible part of the plant. Though the two are different things, they share numerous similarities, especially when it comes to eating. Both fruits and vegetables are living, whole foods. They grow out of the ground and usually contain seeds, although there are exceptions. In some cases such as tomatoes, cucumbers and squash, the seed is planted to create more of that particular fruit or vegetable. Fruits and vegetables need sun, water and soil to grow. Both are also eaten by humans, animals and insects. Fresh fruits and vegetables have a relatively short shelf-life, spoiling if not preserved by freezing, chemicals or canning. Methods for preparing fruits and vegetables for eating are similar. Unlike meat, raw fruits and vegetables are edible for humans. Popular methods for cooking fruits and vegetables include grilling, baking and boiling. Vegetables are also delicious steamed and sautéed. Though it is possible to cook fruits in these ways, it is less common and does not taste as good. Blending raw fruits and vegetables into smoothies or extracting their juice is another popular way to eat both categories of food. Fruits and vegetables are both packed with vitamins and minerals. Different items have different nutrients, but in general, provide enough nutrients to sustain living creatures. Animals that are herbivores eat only fruits and vegetables and people following a vegan diet get the majority of their nutrients from plant food. The most abundant nutrients in fruits and vegetables include vitamins A, C, D and K, calcium, niacin, iron, potassium, magnesium, folate and phosphorous. The most beneficial thing a person can do to create a healthier diet is exchange foods high in saturated fat, sugar, artificial ingredients and refined wheat with fruits and vegetables. Fruits and vegetables are nutrient-dense foods, which means the amount of nutrients in each serving far outweigh the calories. Even fruits or vegetables high in calories, such as avocadoes, are packed with nutritional benefits. Nutrient-dense foods reduce obesity and the health risks accompanying the condition. 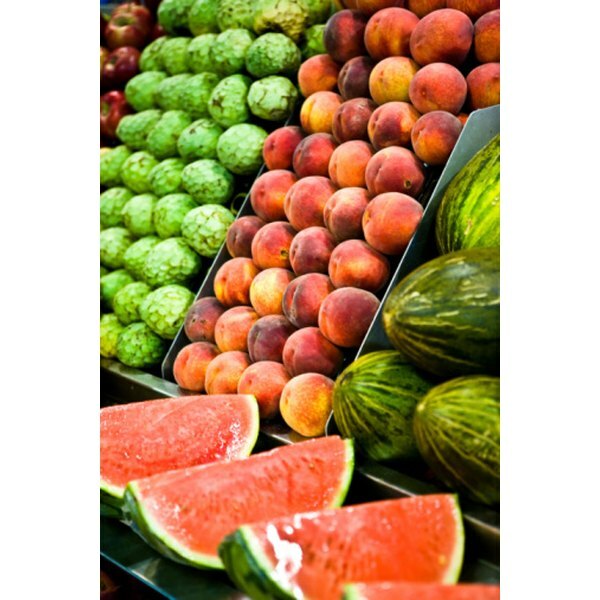 Fruits and vegetables also contain antioxidants, believed to fight free radicals, which have an adverse affect on cells.